A bumper sticker foreshadows the death of the Missoula Independent. It's not like nobody saw this coming. Typically, being bought by a daily newspaper "saves" a struggling alt-weekly like being found by a grizzly bear saves a lost hiker. Last year, the Baltimore City Paper, purchased by the Baltimore Sun in 2014, was shut down. In 2007, the Metro Pulse in Knoxville, Tennessee, was purchased by the big corporation that owned the Knoxville daily paper. And in 2014, despite still turning a small profit, the Pulse was shut down. So when Lee Enterprises, the newspaper titan that owned the Missoulian and hundreds of other newspapers across the country, purchased the Missoula Independent alt-weekly in April of 2017, Missoula Independent staff writer Derek Brouwer knew it could end poorly. Brouwer says he was worried about three things. He worried that it would tarnish the reputation of the paper. He worried that the new management structure would chip away at the paper's editorial independence. And he worried whether the Independent would continue to exist at all, or whether it would be sapped of resources, absorbed into the daily paper, or simply eliminated. Within the span of a year and half, all three of those things happened. Brouwer had feared, he says, "that the credibility and the trust and the reputation of the brand that had been built over 27 years could be captured by a vulture capitalist corporation." And indeed, in a little over a year, the Missoula Independent, a well-respected alt-weekly older than the Inlander, would be shuttered. Brouwer would be out of a job, locked out of his office and his years of work on the Independent website would disappear. The mission of the alt-weekly, in part, is to occasionally stick their thumb in the eye of their more stodgy daily competitors. They are a check on the daily newspaper, which can sometimes be compromised by, say, their owners' interest in a public-private parking garage deal. When the daily owns the alt-weekly, that mission becomes complicated. Immediately, the purchase of the weekly damaged the Independent's independent brand. "Pretty quickly we got some indication that some in the community were not going to respond well to the move," Brouwer says. Their sign was vandalized to read the Missoula ___dependent. 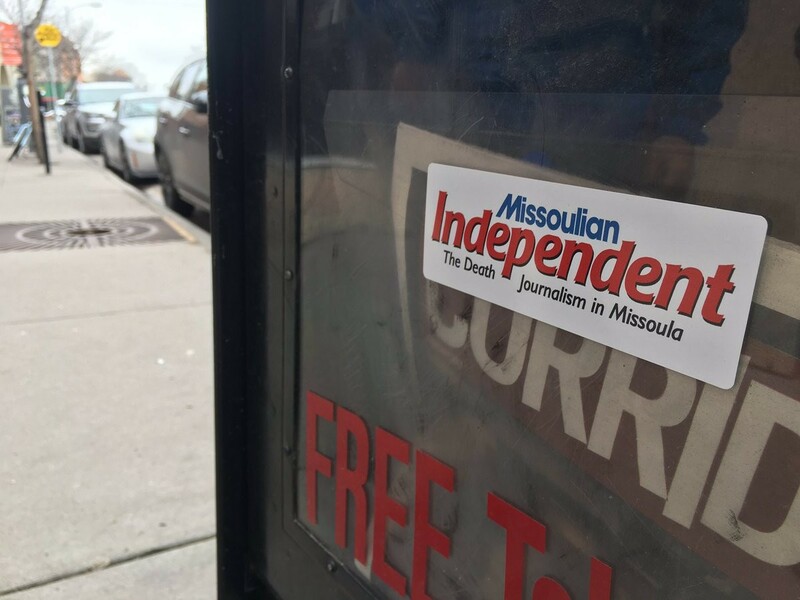 Somebody made bumper stickers proclaiming that the "Missoulian Independent" represented the "Death [of] Journalism in Missoula." And yet for months, the Missoula Independent continued to cover the Missoulian critically. They covered accusations that the Missoulian had "colluded" with a politician to damage the political prospects of a mayoral candidate. They continued to tally the deep cuts that Lee Enterprises was making statewide. But then in February, Brouwer wrote a story about how the Independent would be moving in into the Missoulian offices. The story also included references to cuts to other Lee papers, including the Ravalli Republic. Brouwer says one line in particular — "changes at the Ravalli Republic are expected to be announced publicly on Sunday" — bothered Matt Gibson, the former Independent owner and publisher. After the sale of the Independent, he had been made general manager for the Missoulian, the Ravalli Republic and the Independent. It's an independent journalist's job, of course, to break the news that hadn't been reported yet. In 2016, Brouwer had reported on an editor of the Missoulian being fired for bringing a gun into the office. And here, he'd learned from independent background sources, that the Ravalli Republic was going to be slashing its production schedule from five days to three. But Brouwer says Gibson asked him not to report those details, so he didn't. He just said that there would be an upcoming announcement. But Gibson, Brouwer says, was still upset over the announcement being made public. "He said that somebody over in the Missoulian building said that I had violated company policy by revealing an announcement that hadn’t been made yet," Brouwer says. "He said, technically, he could fire me for that." Brouwer says Gibson accused him of paraphrasing his statements "provocatively" and said he wouldn't give Brouwer an interview the next time he asked. And the offending line? Brouwer says it was quietly removed from the article without him being notified. "It shook my confidence that I would be able to write credibly about the company going forward," Brouwer says. "If we're having this level of pushback and insinuation that I was violating policy over something so minor, how was I going to be able to report about more significant issues down the line?" Ultimately, the Independent never actually ended up moving into the Missoulian's offices. But you wouldn't have read that in the pages of the Independent. In its last few months, the Independent was further restricted on what they could write. It was in the midst of this turmoil that the tiny staff of the Missoula Independent decided to take a big gamble: They decided to unionize. They'd already been talking about the possibility, but the concern over moving offices became a catalyst. The issue wasn't the move itself, Brouwer says, but the process surrounding it. What would happen next? How would they communicate the changes? They knew it was a risk. Unlike several other papers that have unionized, the Independent was losing money. Because of a nondisclosure agreement, Brouwer can't say how much. "I will say that we disagreed about how close to profitability it was going forward," he says. In all the conversations he had with the staff, Brouwer says, the concern over whether Lee could simply shut down the Independent was discussed. But he thought that Lee would be more concerned about damage to their image if they decided to shut down a locally beloved alt-weekly heading into its third decade. "I think I probably underestimated their willingness to do so," Brouwer says. And the union, Brouwer felt, was the paper's best shot at restoring the Independent's image in the community: "We felt like by giving the staff a voice and be able to communicate with the public for what was going on with working conditions, that would help restore some of the trust that seemed to be on shaky ground." The move to the Missoulian was halted amid the organizing effort. But in the midst of union organizing, Gibson gave the Independent writers another mandate: They weren't allowed to write about the union organizing attempt or anything related to it. They were told they were too close to it. "I think there was a certain point where we had stopped pitching stories about it," Brouwer says. Other than a column by Dan Brooks and several letters to the editor, the union organizing attempt wasn't mentioned at all in the Independent. And when a group of Independent freelancers pooled their money together to buy an ad showing support for the union, the ad was rejected. "They were told the publisher denied the ad to run in the paper," says Ariel LaVenture, then the marketing and events coordinator at the Missoula Independent. The union organizing attempt was written about by the Missoulian — with an initial brief about the effort placed, in a grim bit of foreshadowing, on the daily's obituary page. Meanwhile, Gibson sent out an email to advertisers calling the effort to unionize "naive and shortsighted." "It's not in the best interest of the staff, the paper, the community, or the owner, Lee Enterprises," Gibson wrote in the March email. "When it's all said and done, the organizing effort amounts to a dramatic gesture to take some sort of principled stand, but there's no substance to it." He stressed that a union would not give writers more control over editorial content and assured advertisers that he wanted the paper to thrive. "I think the Indy is vital to its community, and I am deeply committed to its continued survival," Gibson wrote. LaVenture says some of the advertisers were taken off guard. "Initially, some of our advertisers were confused as to why they were getting the letter," LaVenture says. "But people were still completely dedicated to the paper." Nevertheless, the vote to unionize was unanimous, Brouwer says. The new union didn't initially demand higher salaries. But they did ask for better health care benefits and the ability to "cash out" their unused vacation days if any of them left the company. Crucially, the union requested that the Independent's operations remain separate from the Missoulian. And that, Brouwer says, was the major sticking point. The Independent was losing money. Lee Enterprises wanted to find efficiencies by combining functions. And in the midst of these negotiations, Lee then offered a brutal choice: Either the Independent would cut most of their staff or they would be shut down entirely. The Independent union officially objected that proposal, launching a #KeepMissoulaIndy campaign in order to stoke public support, hoping to save the paper. The union made a counteroffer, offering to create a joint committee to forge a way forward. They were willing to combine some functions, to move into a smaller office and establish agreements allowing ad reps with the Missoulian and the Independent to sell ads in both papers. "We presented that to them," Brouwer says. "They said that they didn’t see any new ideas there. They were going to have to think about it in context of their upcoming fiscal year. The decision would be made over their heads. We had scheduled two days of bargaining, but it hadn’t lasted an hour." And then, for weeks, they didn't hear a thing. Last Friday, LaVenture says, the union members held a "Support Your Missoula Independent Union" event, including a booth at the city's First Friday festival and a gathering at the Union Club Bar and Grill. Supporters showed up with "#KeepMissoulaIndy" buttons and stickers. The Independent staffers talked about their willingness to compromise with Lee to keep the paper afloat and directed people in ways they could show their support. "We had so many people there," LaVenture says. "Everyone left the event hopeful." Brouwer went to bed on Monday night after putting his final edits on a cover story about Missoula's sole conservative City Council member. And then, he woke up, on the morning of Sept. 11, to see an email that the paper was being shut down. He would still receive his salary and benefits for a time, but he wasn't to come into the office. The doors would be locked. He could schedule a time to come and collect his belongings. "I’m sure there are reasons other than spite for why they would do it that way," Brouwer says. In a particularly brutal blow, the Missoula Independent website was pulled entirely offline. All his clips he'd written over years were gone. "That was one of the main points of anxiety," Brouwer says. The PDF versions of some of them were still available on issuu.com, Brouwer says, but the paper had stopped uploading issues to that platform about six months ago. Gibson, in an interview with the Missoulian, said they would try to preserve the Independent archives. Brouwer says he doesn't regret unionizing. "I don’t think it was the wrong move," Brouwer says. "I think we failed in our key goal which was to make the Independent stronger and more viable." The death of the Missoula Independent, after all, may have happened either way. But at other papers, the death has been slow and gradual. A once proud paper becomes an embarrassment, a shell of its former self. Here, at least, the employees took a stand. Dismiss it as a dramatic gesture if you want. But at least, Brouwer suggests, the Independent went down fighting. That's the alt-weekly way.